Around 2200 BC, the ancient Babylonians found a way to improve water’s cleaning power, and like so many great discoveries, it was by accident. Water had been used to clean cooking utensils that were covered in animal fat and wood ash. By combining the three substances, they inadvertently created the world’s first soap. The Egyptians used vegetable oils and alkaline salts to make their soap, and were perhaps the first people to regularly bathe their bodies and launder their clothes. Did that bit of progress improve social interaction, and therefore help create true societies? History doesn’t say. The hearty people of the Greek empire managed to wash themselves without soap or water. They’d rub down their bodies with clay, sand, pumice or ashes. Then they’d cover themselves with oil, and finally scrape the oil off with metal blades. After the fall of the Roman Empire in the 5th century, the tradition of washing ourselves and our stuff went away, ushering in 1000 years of uncleanliness and bad hygiene, not to mention several deadly plagues. Finally, in the late 1600s, cleanliness came back into fashion in Europe, as people made the connection between personal hygiene and defense against disease. Manufactured bars of soap became available, along with ­— of course — advertising campaigns to promote them. In some countries, though, soap was taxed as a luxury item. Eventually that tax was removed, enabling even people of modest means to enjoy clean bodies and possessions. During WWI, the animal fats that were still used to make soap were in short supply, so chemists in Germany created a cleaning chemical made from synthetic, as opposed to natural, ingredients. The result? The first detergent. Proctor & Gamble’s labs resurrected the detergent idea in 1943. The laundry ‘soap flakes’ they had been selling turned both white and color clothes grey-ish. They improved the ‘synthetic surfactants’ by adding phosphate compounds and other enzymes. The result was Tide®, which could penetrate greasy, difficult stains that soap and water alone couldn’t touch. The product became so popular, especially in areas with mineralized or ‘hard’ water, that stores had to limit the quantity that each housewife could purchase. By the 1950s, detergents had replaced soaps for washing clothes in developed countries. In the ‘80s, detergents were developed that could clean in cold water. In the ‘90s, super concentrated liquid detergents came out, and in the 2000s, biodegradable, green-friendly products were released. 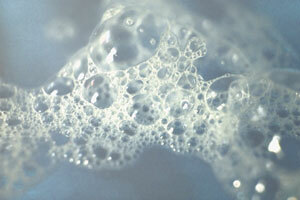 Today, even bar soap is not technically soap; It’s a petroleum- or synthetic-based bar of detergent. Real soap is only available from natural-product companies. The first commercial high-pressure washing of buildings and vehicles in the 1960s went back to basics — just water, the hotter the better. But specialized detergents evolved, as well as the ability to inject cleaning chemicals into the water stream. However those chemicals were often caustic, removing paint as well as the dirt. The environmentally-friendly detergents made from that formula were an immediate success among cleaning contractors throughout the country. Now, his company EnviroSpec offers a family of cleaning chemicals for every possible need, having made a huge impact on the mobile power wash industry, and leaving everything from houses and trucks to commercial kitchens and gravestones looking newer than they actually are.